"Green Star reaffirms WWF’s commitment to environmental sustainability, not just in the work we do, but also in the way that we operate." This carefully-designed office space, situated in a century-old former wool store in inner Sydney, isn’t just a base for WWF to conduct its advocacy and conservation initiatives but also a place where WWF-Australia can minimise its own environmental footprint. By achieving a 5 Star Green Star – Interiors rating for the fitout – one of only three organisations to do so since the launch of the tool in 2012 – WWF-Australia has reaffirmed its position as an environmental leader. WWF’s goal is that our global footprint stays within the Earth’s capacity to sustain life and the natural resources of our planet are shared equitably. 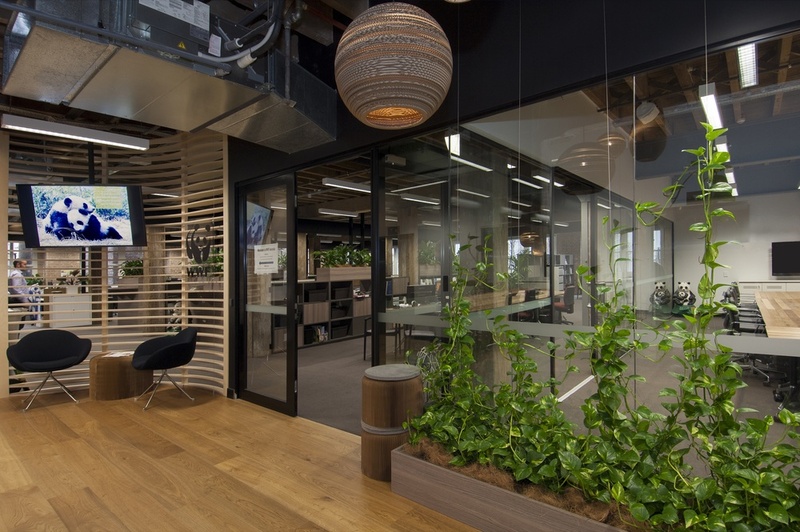 By achieving a 5 Star Green Star – Interiors rating for its Australian headquarters, WWF can certifiably say that environmental sustainability is within the DNA of its operations. “We are delighted to receive this vote of confidence from the Green Building Council of Australia,” says WWF-Australia Chief Executive, Dermot O’Gorman, of his organisation’s recent Green Star achievement. WWF-Australia’s office is located in a former wool store in Sydney’s inner city suburb of Ultimo. As with any major refurbishment, the space posed challenges, but through Green Star the design team has proved that older buildings can still set a high bar when it comes to sustainability. Despite moving to a larger office space (increasing the floor area from 822m2 to 1,153m2), WWF-Australia has cut its annual energy usage by around 21,000 kWh per year and slashed its emissions by around 14.5 tonnes. “We couldn’t be happier with the results. The savings that we make on running our office, combined with the productivity increases we are seeing from happy staff members, mean we have more financial resources to devote to our conservation efforts,” explains Mr O’Gorman. WWF Operations and Commercial Manager, James Meharg agrees with his CEO’s thoughts on the benefits offered up by the new space. ESD consultant, DesignEco, adopted a biophilic approach when designing WWF’s new HQ, connecting employees with nature and investing in the health and wellbeing of workers. The office mimics and references the natural world through its lighting, furnishings and layout. The space is open plan and features plenty of plants, wood, bark and natural colours and materials. Meeting rooms and breakout areas encourage collaboration between staff, while a state-of-the-art ventilation system maximises the flow of outdoor air into the space. Operable windows allow workers to catch the breeze, and WWF reports that on nice days the air-conditioning stays off. Recycled office equipment and furnishings have also been used to cut costs and save material wastage, with recycled desks from Fairfax’s old offices given a new life at WWF. Mr Meharg says that the biophilic design approach has captured people’s attention and allowed the organisation to ‘walk the talk’ on sustainability. It has also met the organisation’s responsibility and commitment to its staff. “We’ve been overwhelmed with positive reactions from staff. This feedback about the ‘feel’ of the office is the biggest compliment we could get. Pursuing an environmentally responsible, biophilic office space has been a rewarding experience for the entire organisation,” he says. Take a virtual tour to see the interior for yourself.